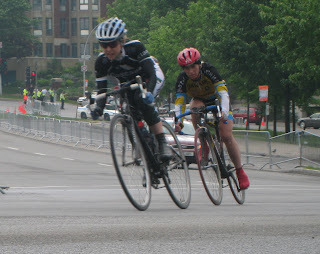 We took our own advice and headed over to Mount Royal to see the 11th women's Montreal World Cup Road Race. Especially if your name was Judith Arndt. She won the 110.66 km race in 3:11.34 (avg speed 34.65 km/h) in a final sprint to the line with 2nd place finisher Fabiana Luperini. Full results here from the UCI and here from cyclingnews.com. The results were decent for Canadians: one podium, two Canadians on the National Team were in the top ten, and a total of three Canadian "cyclistes" in the top ten. Congrat's to everyone who came to Montreal to race and especially to those superhumans finished this very physically challenging race. Come back any time! 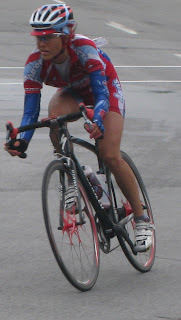 For historical buffs, the French cycling legend Jeannie Longo-Ciprelli was DNF in position 81. She is 11 months older than CFM! 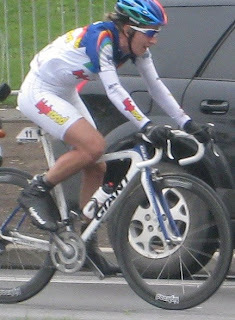 Unlike us, she is ... "la plus titrée de toutes avec 30 médailles aux Jeux Olympiques ou en Coupe du monde cycliste, treize championnats du monde, trois victoires du Tour de France féminin, 38 records du monde, et 800 victoires depuis sa première licence" (french wikipedia). In weather news, the race started in rain, but stopped about halfway, a very good thing for racers and fans alike. The UCI's webpage for the race is here, and the real name of the event is la Coupe du Monde de Cyclisme Féminin 2008, somewhere to that gets added Montréal and Route (road). 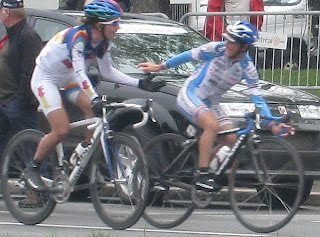 In English it is "Montreal Women’s Cycling World Cup." These women remain in the Montreal area this week for the 7th edition of the Tour du Grand Montréal. This stage race visits Granby, Chateauguay, Mont St-Hillaire, Lachine and Little Italy over the next few days. Starting the second hairpin, this group wasn't at the front of the race. Every possible combo of cool/wet weather cycling clothing on display. On the steep upper section of Montréal's 1.7 km Mont Royal climb. Riding through Montréal's Mount Royal park near the top of the climb. The Camilien Houde climb is long and steep - and the city's best climb. Quick snack at the feed zone - drink that food! This woman was cheering on all slow uphill riders, and often running faster than the riders. The race is finished and it is oxygen-replenishment time. Canadian Alex Wrubleski - Webcor builders. The trees behind her are working hard to provide the oxygen she needs. Cycle Fun Montreal would like to thank all the racers, team members, organizers, team and event sponsors, and the volunteers (and fans!) who together made this a successful and superfantastic event. A local note: wouldn't it be great if they closed Camilien Houde to car traffic, just once a week, say, on Sunday mornings, so cyclists could enjoy our "world class cycling facility" without cars constantly passing us, especially on the extra-narrow road at the top through the canyon? Especially since our Olympic Velodrome was closed and turned in to a zoo? Had quit just a bit earlier and ask to be towed up the mountain to see her mom who was up there. FYI, in case I am misunderstood (... again) I'm not dissing her. Anyone who can ride this course a few times fast, as everyone on Sunday did, gets my respect. #46 rode hard until she couldn't ride anymore, that gets my respect 100% any day. I wish I could ride as hard as the weakest, slowest of these women.